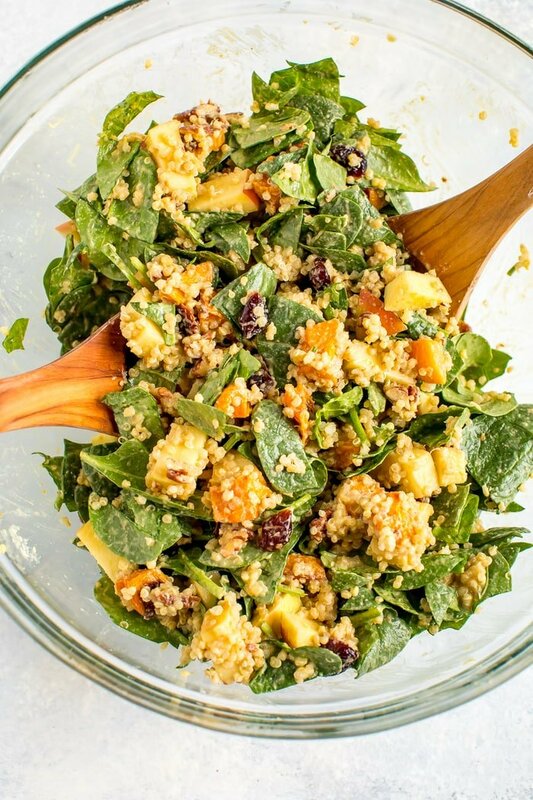 This quinoa spinach salad is loaded with fall favorites like butternut squash, chopped apples and quinoa. It’s is packed with nutrition and flavor. You’ll love the apple cider vinegar tahini dressing! Hi friends. How’s your Sunday going? We’ve spent most of the morning gearing up for a hurricane. … we went to Whole Foods for a few pantry staples; Lowe’s for a new flashlight and 711 for ice. I’m really hoping the storm creates less damage than what the meteorologists are predicting, but it’s always good to be prepared. In other news, I’ve been getting super excited about pumpkin recipes lately. I’m truly sorry if you hate pumpkin. Not only are you missing out on a boatload of nutritional benefits, but I just noticed that all the recipes I posted recently have pumpkin in them, even these healthy apple cinnamon muffins. Like I said, I’ve been on a bit of a pumpkin kick… but you’ll be happy to know that today I have a pumpkin-less recipe that features more fall produce favorites — butternut squash, apples and greens. I’ve been eating these things separately or in other dishes, but finally decided to throw them all together for a tasty salad. 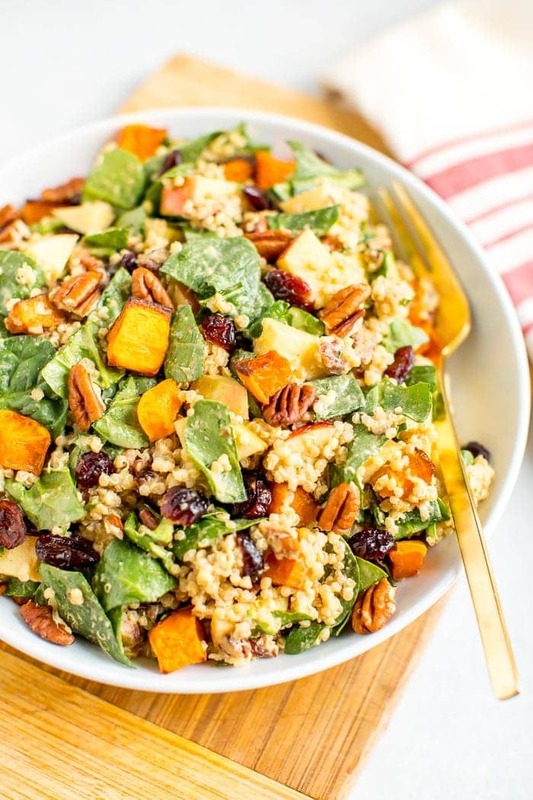 Hearty fall salads are seriously the best! 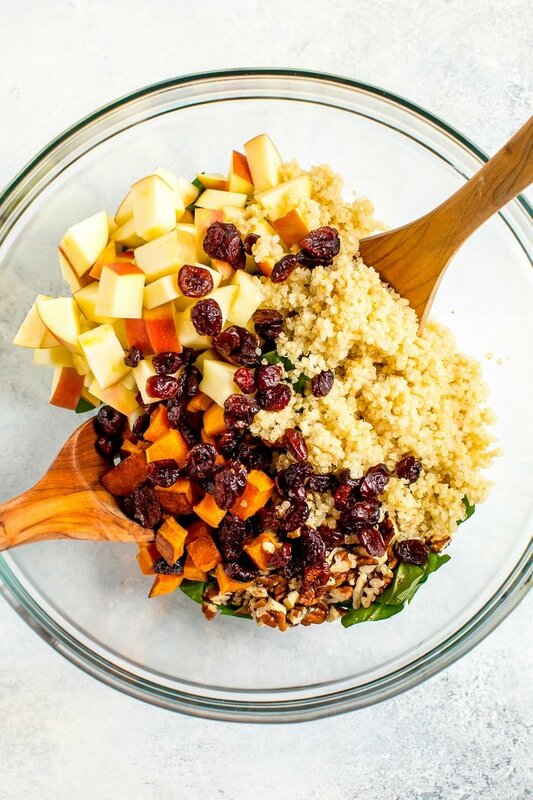 In this Quinoa Spinach Salad, the roasted butternut squash makes it sweet and satisfying, while the apple and pepitas add a nice crunch. Quinoa adds some staying power and the spinach nourishes the body in a way that no other food (besides other leafy greens) can. If you like my garlicky kale salad, you’ll love this one because the dressing is almost exactly the same – I just added a little maple syrup to sweeten it up a bit. 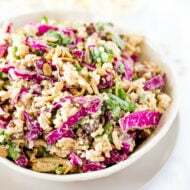 And if you enjoy this salad, you should also check out my full roundup of quinoa salad recipes. 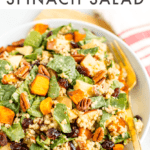 If you make this fall harvest spinach salad be sure to leave a comment and star rating below. 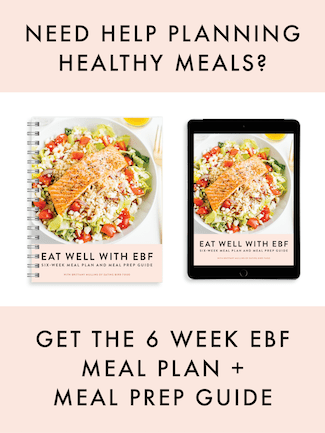 Your feedback is not only helpful for the EBF team, but for other EBF readers as well! 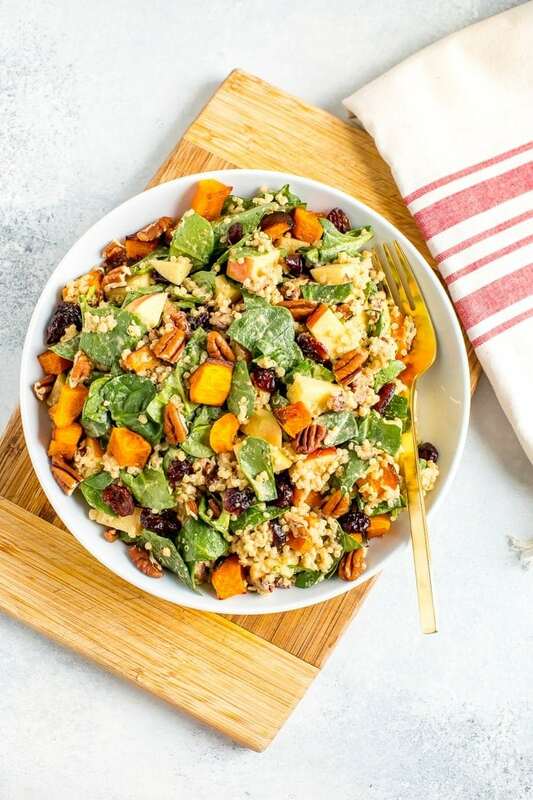 Loaded with fall favorites like butternut squash, chopped apples and dried cranberries, this fall harvest spinach salad is packed with nutrition and flavor. Prepare the squash by peeling it, cutting it in half and scraping out the seeds. 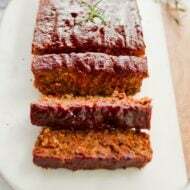 Cut the squash into bite-size cubes, place on a lightly oiled baking sheet and roast at 400° for 30-40 minutes, turning once or twice, until all the pieces are tender and have a few small brown spots. If your pepitas or pecans are raw, you can toast them in the oven with the roasting squash. 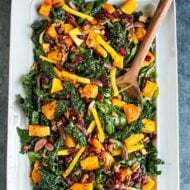 Spread seeds/nuts on a separate baking sheet and add to the oven with the butternut squash for 5 to 10 minutes or until the seeds/nuts are golden and crunchy, then remove from the pan to cool. Be sure to watch the seeds/nuts carefully because they can burn quickly. The pepitas will take less time to toast than the pecans because they’re smaller. 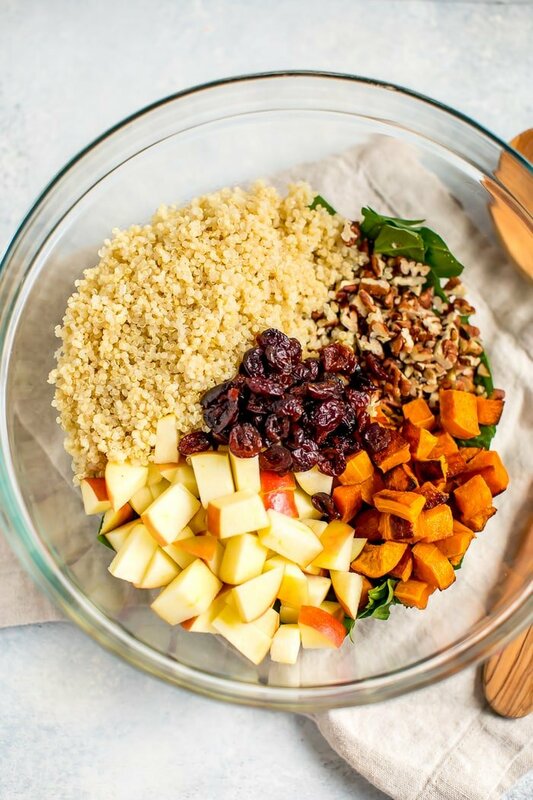 While roasting the squash, toss together spinach, cooked quinoa, apple and cranberries in a large salad bowl. Add cooled pepitas (or pecans) once they’ve been toasted. 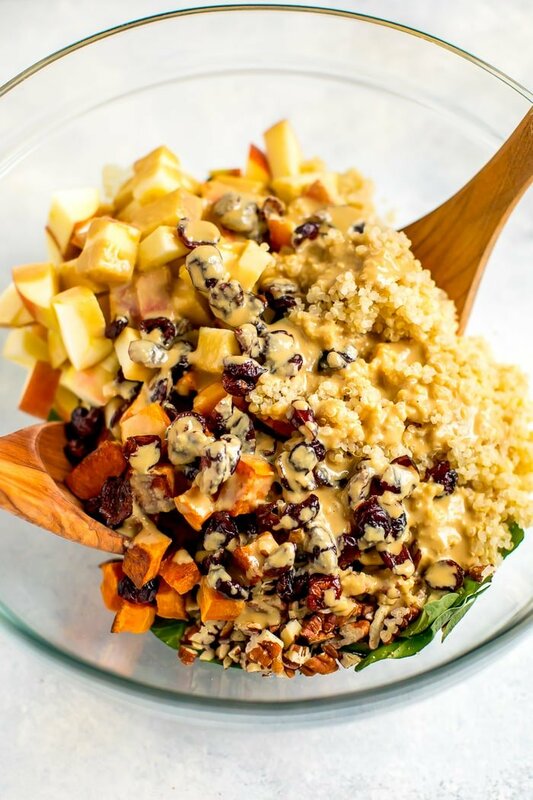 Prepare dressing by placing all remaining ingredients (tahini through maple syrup) in a blender and blend until smooth. Once the butternut squash is done roasting, allow it to cool and then place into the salad bowl with the other ingredients. Pour the dressing over the salad and toss to coat. Serve immediately. 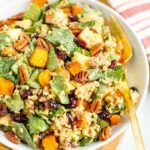 I love the idea of using Quinoa in a salad for some protein staying power! I’ve never tried it but I definitely will! Nothing better than roasted squash and dried cranberries in a salad! I hope you love it Amanda! I hope the storm doesn’t end up being as bad as anticipated; all over the news here in Ireland too…. How could anyone not LOVE pumpkin! I’m eating it pretty much everyday in one form or another, can’t get enough. When you can’t get pumpkin…eat butternut squash! Totally with you! Love your salad! The dressing sounds delicious! Hi Sarah – I do have a quick question. Would you recommend the classic or lean P90x program for me? I feel like I should have prepared for this thing a little more than I did. Toly just informed me that we are low on bottled water so that could be a problem. :/ Stay safe love! Love your website – I’m addicted! 🙂 I have done P90X before and LOVE it! It makes you want to puke the first week but it gets better as you go along – good luck! Mmmmmm I love giant fall salads too! I jumped on the P90X bandwagon about a year ago but quickly fell off. I think the program didn’t work for me because I get bored very easily and once you learn the routines your doing the same thing all the time it felt like. On the bright side, the work outs themselves are really great and you do see the benefits quickly. I like to incorporate the workout separately into my own routine each week. I’ve done two full rounds of P90X. The first time, I did the “traditional” rotation and was very disappointed with my results. The second time, I did the “lean” rotation and added 3 additional runs per week and was THRILLED with my results! Yes, it can get monotonous, but I’m happy I found a way to make it work for me! That’s awesome Victoria. I was curious as to the difference between the traditional and lean and which one I should choose. After reading your comment, I think I might try the lean program. I can honestly say that I have never followed a blog before yours. I have always been a health food junkie (without the junk of course). I stumbled onto your blog and I have been reading and rereading it over and over again. I am living abroad in the Republic of Georgia, and whenever I feel homesick I read your blog. Your positive attitude helps me feel less homesick. I bet you didn’t expect to hear that on a salad recipe comment;) Anyways, I did buy P90X before coming to Georgia. I wasn’t sure there would be a gym. It is pricey so I bought it from Amazon. I read the top comment and I am sorry, to the Beachbody coach. I have to watch the P90X tapes with the sound off, Tony…he is a little too motivated, however, now that he is some of the only English I hear…starting to appreciate his lame jokes. Overall I have been a very fit person for a long time. I ran DI track and cross country all throughout college. I only just graduated in May, and P90X has many of the moves that we did to stay lean and race ready. It really gets your heart pounding. I highly recommend it. Also there is no coffee here in Georgia, if you don’t count instant or Turkish, and I don’t, but when I get home I am totally making your pumpkin spice latte:) Thanks for writing this blog. You are a lifesaver to this homesick teacher. p.s. Sorry this is so long, obviously I haven’t been using English too much, and it all comes out on a post! Hi Mary – I’m excited to be the first blog that you’ve followed. Thank you for such a sweet comment. Did you do the full P90x program? I’m wondering if I should do the classic or lean program? Also I didn’t bring weights with me or a pull-up bar. I am using bands, and have really great results! This salad was so so good! My boyfriend and I said it was the best salad we ever ate! Oh wow!!! I’m so happy to hear that you all loved it! Looks like the perfect fall combo! i have to go pick up some NOOCH! This looks great. I think I need to get some spinach! Hi! I discovered your blog the other day and love it. I made this salad today with just a few tweaks based on what I had at home. Instead of spinach, I roasted some broccoli and at the same time roasted the butternut squash seeds (I had roasted the squash last night for some soup), as well as some chick-peas tossed in olive oil, pepper, paprika and turmeric. I tossed all of that plus the squash in the dressing with the quinoa, apple, cranberries and some diced red pepper I had. Super good, thanks for the recipe! Just made this tonight and it was really freaking good! Even the boy ate it! Had to adapt on the fly by replacing tahini with peanut butter but it was excellent nonetheless. I want to make this for a Thanksgiving gathering. How many servings is it? Finally got to make this last night. Everyone loved it. I added some mushrooms and some cucumber, put more than 3/4 of squash. I was serving 3 adults and I just approximated the quantities. It was soooooo good! I’ll be keeping this in our fall rotation for sure! Neat combination. Thanks for sharing! The first thing I noticed when I looked at this page was the beautiful bowl of salad. I love that it only takes a short amount of time (relatively short anyway) to get this from all the lovely ingredients to chopped up and ready to eat. Not only that but practically everything in here is so healthy for you that you can eat as much as you want. Bummer! I’m so sorry about that! I’ll updated the time. Hooray. So glad you liked it Caitlin. Accidently came on this site! LOVE this blog! Thank you! This looks delicious! Is there something you can substitute for the nutritional yeast? Or can you just leave it out? Hey Raquel. It adds an amazing nutty, cheesiness to the dressing. I’d highly recommend trying to find it at your local grocery store because it really makes the dressing! This recipe is absolutely delicious. Love all the salad ingredients and the dressing is amazing. I will definitely be making this again. My husband & I loved this recipe. I have PCOS & I can’t have gluten or dairy so this recipe worked out great for me.